WordPress security issues that website owners should be aware of and steps to avoid vulnerabilities. Why does WordPress have security issues? WordPress is wonderful tool to enable set up of an affordable CMS website. CMS stands for Content Management System, which means that the client can manage content. Using WordPress, the web developer can take control of design, structure and layout and pages are easily accessible so the client can update in-house. WordPress is arguably the most popular CMS website builder; making up 25% of the internet today. Why? Because it has so much functionality, created on a public network. It is free. It can be fully customised by a WordPress website designer. Used correctly it is also search engine friendly. The Open-Source software is available to everyone across the globe. This means that every time a version is released anyone can easily download and examine the source code. Curious hackers set to work finding holes which allow them to take a site down, make it act oddly, send a message or host illicit content. The longer a WordPress version has been available, the more often, and more easily, it is tapped into. For fun. To prove something. As an experiment. To learn something. To get a message across. To steal data. Hackers are real people developing programs which look for security holes in out of date WordPress installs. Not all hackers are malicious. Often “hackers” are reporters of security issues and vulnerabilities. White hat hackers are good news for technology. However, black hat hackers are not such good news for your WordPress website. WordPress being Open-Source is a positive thing, as the full source code is available to be examined by the WordPress community too. Issues and vulnerabilities are found and fixed much quicker than with traditional software. That is why there are so many ongoing releases of WordPress. Hackers find holes, the WordPress community fights back. Is WordPress safe? Yes. It is generally really safe when kept up to date. And there are more steps you should take to keep a website secure. 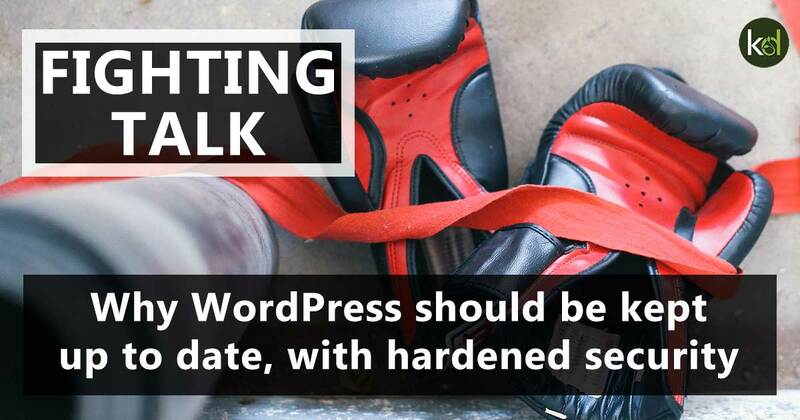 WordPress core, plugins and themes must be kept up to date to lessen the chance of a hack. The more up to date the version, the less chance a hacker has. I encourage any WordPress website owner to keep the WordPress install up to date. Use trusted plugins and themes that are checked for security, and keep these up to date as well. Before updating back up the database, just in case there are conflicts. A database backup means the website can be restored. Enforce strong passwords and change them regularly. Use an SSL certificate to make sure that communication between user and browser is secure. Most of these takes the necessary steps to keep the site secure and free from attack. Use an automatic backup system to enable you to recreate your site quickly and easily if you do come under attack. Of course a website would never be 100% protected against attacks, but it can be 99%. I offer regular WordPress updates and maintenance to keep websites secure.